Opis: What would you do if it rained blue water from space? On 1998 March 22, no umbrella was needed, as the blue water came attached to a stony meteorite that landed in Monahans, Texas. The meteorite fall was seen by several boys, and was being carefully scrutinized by NASA scientists within 72 hours. The scientists discovered an unusual patch of salt crystals on the meteorite's surface, turned blue by radiation in space. 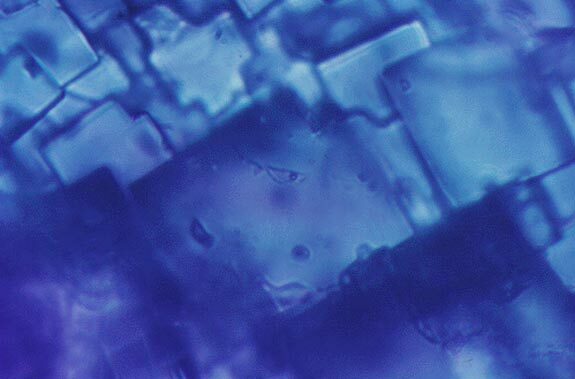 Inside the blue crystals was an even bigger surprise - small droplets of water. One of these water droplets is visible near the very center of the above photograph. Water is a key factor in life, and this drop of water most likely dates from 4.5 billion years ago - from the early days of the Solar System. How salt and water came to be attached to this asteroid chip still remains speculative. What did the boys do with the meteorite? First they lent it to NASA. Then they sold it on the Internet.